I'm still dealing with a sensor that occasionally registers as a trouble zone. This is the one located diagonally 16' from the console and mounted horizontally, as opposed to vertically, as most of my window sensors are. An image was provided in the "display errors" thread (reply #93). 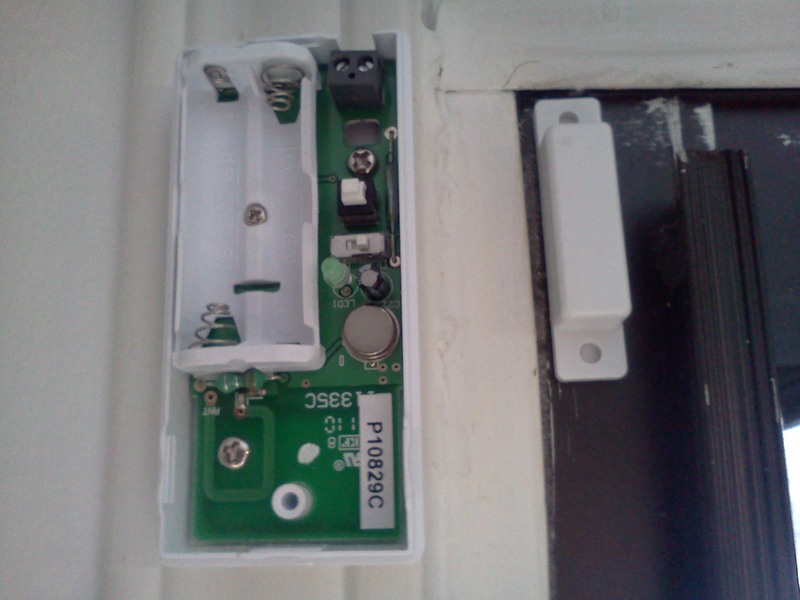 99 9/10% of the time the sensor and magnet are not engaged as the window is open. After I moved the the setup from the right to the left side of the window, as detailed in reply #93, the zone did not "blink" for several days but did eventually. I'd read about the addition of an antenna to the sensor and researched whether copper could be used. Most information referred to receiving antennas but I didn't really find that it could not be used as transmission material. Assuming greater (diameter) is better and having read that stranded is acceptable I first used 19" of stranded 16 gage rapped around the top of the sensor. That did not work, as the console eventually registered a flashing zone 4! I've now had several trouble free days merely using 19" of bell wire. So it remains to be seen if that is just coincidence or the result of the bell wire antenna. In an attempt to set this system up as fool proof as possible, if the bell wire antenna is functional, I'll use the system on six windows upstairs, one of which over probably a month period registered trouble one time also. My question is then, can mere bell wire work? Thank you! Re: Sensor antenna material question! My question is then, can mere bell wire work? Thank you! Yes bell wire can work as well as anything else. I use stranded and solid for passive radiator/repeater on motion sensors and slim line switches. Empirically I can't tell a difference as far as range. Any one with a field strength meter could differ. But I like 22ga solid copper available from Radio Shark. It is stiff enough that I don't need to tape on the wall to keep it vertical. You might peruse BrianH's information on the DS12 to find the rough location of the PC board antenna and position the radiator in line with it for max coupling. There is a loop around the mounting hole. Says ANT. That is part of the antenna. If you look closely at the circuit board you will see a shadow of the other part of the antenna on the back of the PC Board. Anyway after a long drawn out speech. That is the area where the antenna for the DS12A is. I am thinking of purchasing a few DS12A for my SC1200 system and attaching an external antenna. I have 3 to 4 pesky DS10A that are too far to reach my SC1200 even with a passive radiator in place. It appears from the picture below the DS12A has 310Mhz SAW in TO-39 metal can and VIA marked Antenna nearby. Yes it has a saw device to determine the frequency. The schematic is for the Radio Shack OEM DW Sensor that X10 seems to have kept the same FCC ID B4S-DS11A for. Not an rf circuit expert here, but I thought the design choice is LC tuned design or SAW based fixed frequency design (in X10 case 310Mhz) I was hoping to add an external antenna and NOT affect the 310Mhz transmission frequency. With the SAW, you are probably OK but - no guarantee. I have seen soldering to the circuit with LC tuning detune it to the point it wasn't received at all. Will not effect the frequency but a long wire hanging on the PCB antenna may detune it. BVC & AHP mean never having to say "TURN THAT LIGHT ON WHEN YOU GO BY"